A few years ago I had the pleasure of visiting Mexico on a business trip. Off the shore of our resort, on a little island, stood a small stone structure reminiscent of an ancient Mayan building. I asked a staff member about the building and was told that it was indeed a Mayan building and marks an important date in the earth’s revolution around the sun. I forget whether it marked the summer or winter solstice or the equinoxes – what is important is how the structure did this. The building has two small windows on opposite walls and as the sun rises on a specific day each year, sunlight passes through them, briefly lighting the second window and the ground behind the structure. This occurs only on the day of the special event. Intrigued, I visited the island and explored the building, where I found the windows on opposite walls. Looking through one window I saw the sun and ocean as daylight entered the little room. When I went outside and looked through the back window I saw only the inside of the room and if I positioned myself properly I could see the other window facing the ocean. I found it amazing that throughout the year, as the sun rose its rays shone through the first window and caressed the back wall of the hut. But for one designated moment in the cosmic cycle the second window was set aglow by the sun’s rays. A spectacular display marks that important moment in the calendar year, which passes silently as the window goes dark for another year. 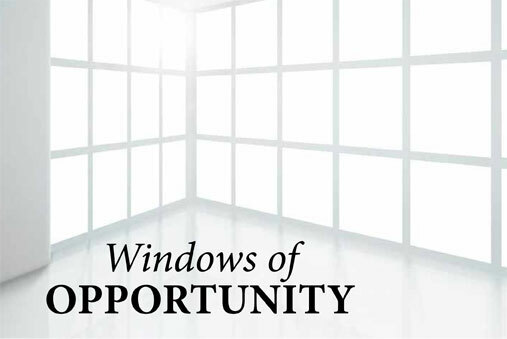 Opportunities in life are like the second window. There are opportunities in business, sports, relationships, in every other aspect of our lives, and each exists for a time before passing. When windows of opportunity present themselves, they may be dazzling and capture the attention of viewers. When we notice them, we have the chance to respond. Unfortunately, the duration of the opportunity is beyond our control. When I sold cars, I was told to do everything possible to sell the client who walked through the door. It is statistically proven that when someone is interested in buying a car to the point of visiting a dealership, they will do so within a few days. This statistic turned out to be true. When I sold a car I did so within a few days of the first meeting. When I didn’t, I discovered that they had bought elsewhere, sometimes just hours after I met them. For a brief moment the opportunity for a car sale with that individual existed. And when it passed, it would not re-appear for another four to six years. The same is true for all opportunities. If we wait too long, the window of opportunity goes dark and our ability to take advantage of it is lost. Some windows of opportunity, the most precious ones, happen only once in a lifetime. So one of the most important traits we can posses is diligence. The diligent seize opportunities as they present themselves, thus amassing wonderful experiences and precious possessions. Some onlookers may call them lucky but luck has little to do with it. Opportunities favour no one. Some are visible to all who are looking, while others are presented to us exclusively. Regardless, it is always the diligent who seize them. Never pine or cry over a lost opportunity, for nothing can turn back the clock or recreate it. Rather, turn your efforts to recognizing opportunities and preparing yourself to embrace them. For as one window of opportunity closes, another will soon appear. When your window of opportunity is set aglow, be quick to recognize it and swift and effective in seizing it. This entry was posted in Spark by Envision Magazine. Bookmark the permalink.